Helpful links: Sadly outdated -- this has taken a backseat to just keeping the sewing flowing. SBP on Facebook: If you're looking for regular updates, the Facebook page is the place to be. Consider "liking" SBP for the latest! Wholesale inquiries: I don't generally take on from-scratch sewing for wholesale -- it just doesn't work well with my business model. However, I can do wrap conversions in bulk -- please click for more details. Site map: Not as up to date as it should be, alas. 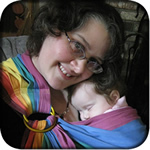 Do it yourself: Takes you to my personal site (Jan Andrea at Home on the Web) where I have sewing directions not just for slings, but for many kinds of baby carriers and other baby items. sleeping baby productions is a proud member of the Baby Carrier Industry Alliance, and I am among the founding board members. The BCIA is working hard to make sure that all baby carriers on the market are safe, and that users are aware of how to use them properly. Please consider supporting the BCIA if safe baby carriers are important in your daily life!